At Interiology Design Co., we create exquisite interiors to exacting standards, transforming our clients’ homes and enhancing their lives. Our award-winning designers collaborate with each other and with our craftsmen to manage every aspect of a project from concept to reality, while clients experience the excitement of watching their design come together. The end result is inspired, enduring, and highly livable. Elza B. Design’s French-American owner excels at creating stylish and inviting interiors for the discerning clientele. Known for infusing her work with European flair, Barbara is a pro at transforming a space into an oasis that truly feels welcoming! Elza B. Design was featured in numerous publications including New England Home Magazine, The Boston Globe, Maine Home + Design and most recently, Boston Magazine and North Shore Magazine. She is the 5 time Winner of the 2013- 2018 Best of Houzz Customer Satisfaction Award and the Best of Houzz Design 2018. An attentive listener and gifted colorist, Barbara will make sure to create a High End interior that meets your needs. She is not afraid to bridge old with new and loves to create restful and unique contemporary, transitional, eclectic or "traditional with a twist" interiors. Her European roots greatly influence her work, as does her background in art and fashion. Barbara will work closely with you to help you create a truly unique space. If you work with an architect or a team of contractors, she will collaborate with them to ensure the space planning and material selections are harmonious and respect the design goals. An organized and dedicated professional, Barbara works hard to deliver! Feel free to reach out to us, we'd love to help with your design project! Barbara is a member of the IFDA (International Furnishings and Design Association) ASID (American society of Interior Designers). Boston Area Premier Interior Design Group- Best of Houzz Winner 5X! After closing my law practice in criminal defense to raise my four sons, I went back to school for design. I thrive on the creativity this profession allows and always try to look at each project both "in and out of the box." My goal in design is to create a beautiful "home" for my clients. We do this through consistent communication, hard work and attention to detail. In the end, it has to reflect the homeowner. I want people to feel like they can put their feet up and really live in their homes, though that means different things to different people. The point is to achieve the design that fits the client's needs. ROI Design is Boston’s only design firm focused on the needs of busy, growing families. We create thoughtful, organized interiors so every member of the family feels at home. I started ROI Design to help families with young children bring order and beauty into their homes. I love babies and kids, and have a passion for creating spaces that inspire their learning and development. By understanding your family’s lifestyle, needs, and challenges, I help solve your unique aesthetic and organizational problems. My firm’s name represents the process I follow to achieve this: - Reflect on your practical and aesthetic goals for your space. - Observe how you and your family lives to identify opportunities and develop systems to improve functionality. - Inspire everyone in your family with my design plan to love, learn, and grow in your home. An expert in family-centered design, Kelly Rogers works with her clients to create kid and pet (and adult!) friendly homes with decidedly "grown-up" style. She specializes in designing mid-range to high-end spaces that are polished, yet comfortable, colorful, yet serene, and beautiful, yet durable. Now you don't have to wait until you're an empty nester to live in a home you truly love! 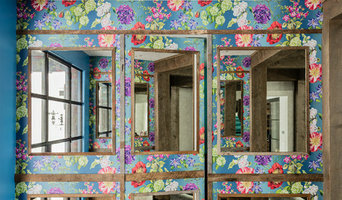 Kelly's signature style ranges from traditional to transitional, and incorporates classical design motifs, global influences, fresh color, and unique pattern combinations. She eschews formulaic approaches to create truly original interior spaces with equal parts elegance, simplicity, and practicality. In addition to understanding the needs of busy families, Kelly also brings a business-like approach (with a healthy dose of humor!) to her work. She previously spent 11 years at advertising and digital marketing agencies in account management, working with Fortune 500 clients in a variety of industries. There, she developed her client-driven philosophy, creative vision, project management expertise, and attention to detail. Although she loved working in a creative business, after the birth of her first son, Kelly knew she did not want to return to agency life. But she wasn't ready to 'retire' just yet, either. A family member provided unexpected inspiration for a new career. She moved into a beautiful new home, but had delayed furnishing and decorating until her children were older. A new mom herself, Kelly could relate, and was sure that many other families did, too. When she asked Kelly if she ever considered pursuing interior design, the idea for Kelly Rogers Interiors was born. A certified architectural color consultant, and candidate for a certificate in Residential Interiors at the Boston Architectural College, Kelly is the author of the design blog Interiors for Families. 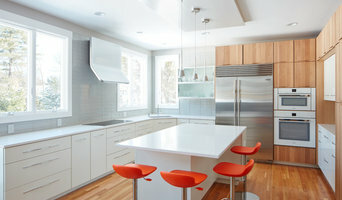 She is an active member of IFDA and NKBA, and her work has been seen in The Boston Globe, Houzz, Wayfair.com, and several blogs and digital publications. Kelly attended Williams College, where she earned her BA in art history and American studies. Kelly lives in Newton, Massachusetts with her husband, two sons, and their mischevious and adorable lemon beagle. Lux Lighting Design is a Full Service independent Lighting and Interior Design firm led by award-winning Lighting Designer Doreen Le May Madden; Residential and Commercial Design for interior and exterior with a timeless creative style. Details from conceptual to a fully comprehensive design, complete with drawings and presentation boards for all products are provided. We are fully engaged for a proper installation and for addressing all details that arise during construction to keep the original design intent. Lighting control systems and shade control systems are designed to be user friendly and practical. Suburban Boston Interior Designer, Best of Houzz 2014, 2015, 2016 Linda has been pleasing clients with full service, residential interior design since 1983. Your Inner Visions will come to life with exquisite wall colors, graceful window treatments, room enhancing lighting plans and comfortable furniture. Decorate from your easy chair, conveniently at home. My process starts with a tour of your home to discover your architecture and understand your needs. Then we look through pictures of rooms to uncover your taste, style and color preferences. My aim is to produce a home that is beautiful, functional and personalized to enhance your lifestyle. Linda will help you define your taste and style, by going through pictures, looking at coordinated color boards of fabrics, wall coverings and rugs. Consultations are conducted in your home at your convenience. Linda can help you with; furniture, color coordination, layered lighting plans, window treatments, art work, rugs, wall treatments Project management with proven service people to install all of the above. Linda was recently chosen as one of 15 interior designers to participate in the prestigious Boston Design Center’s Designer on Call Program. The Designer on Call program has been available to the public since 2005. As part of her commitment in the DOC program, she will participate in a number of sessions learning about the 1,200 luxury product lines at the BDC, such as world-class fabrics, carpets and furniture. Recently the designers saw an impressive demonstration at the Robert Allen showroom on their new Crypton stain-resistant fabric. Each month designers will meet to continue acquiring expertise about the Boston Design Center showrooms and resources.